Well, we’ve got a three-for-one of launches tomorrow (Feb 26th), with potentially an exciting new Toro Rosso livery, so if we don’t get to rounding up these three for completeness’ sake, we never will. So let’s do it now. When Mercedes launched their car, most of the attention was on the shape of the thing rather than the livery – as the reigning (multiple) champions, how they’ve interpreted the new regulations is perhaps under more scrutiny than any other team; and what’s more, they’re just about the only team so far not to have one of those stupid shark fins/sails/flags/whatever you want to call it sticking out the back of the engine cover. As for the livery, though, there have been tweaks from last year. Yet again they’ve made a slight change to the way the Petronas turqoise is applied to the car – it’s now in electric-looking strands that extend right the way along the side of the nose cone, and on to the front and rear wings. But they still haven’t made it so that the Petronas logo itself is completely backed by turquoise – it still runs partly onto the silver. So it still annoys my slightly pedantic tendencies. Over at Ferrari, meanwhile, it’s perhaps not surprising that after a pretty unsuccessful season on the track, the team have ditched the white top half of the car and gone back to a red engine cover. However, the presence of that flipping shark fin means that there is an area of the car that gets painted white. It’ll be interesting to see, if the fins do end up being got rid of at some point, if the white moves onto the engine cover or is lost entirely. Otherwise, we also now have white rear wing endplates (which, unless I’m mistaken, is for the first time ever?) and thin stripes along the side of the monocoque. 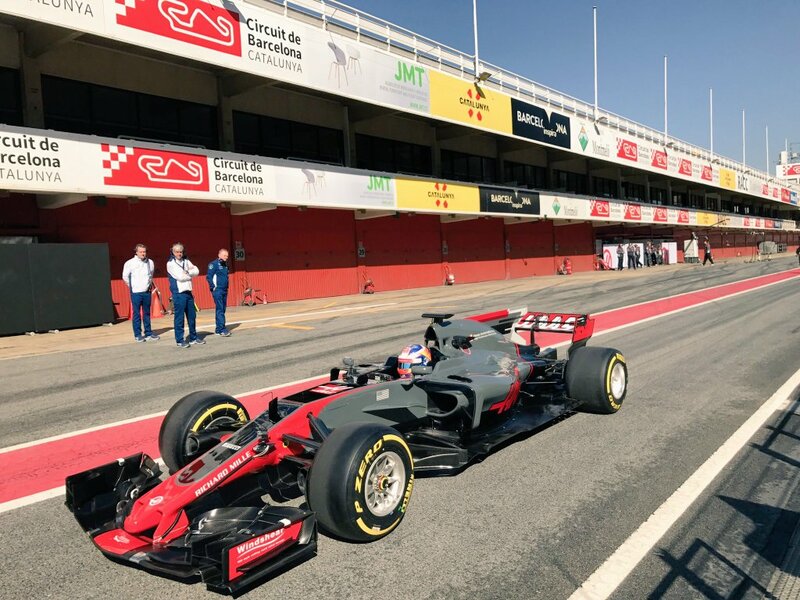 To be honest, it’s all looking a little busy, and even though it’s basically just “a red car with some white bits”, the sheer number of logos the car has on it means that I think the team could do with having a bit of a rethink of how they work things at some point. It’s also kind of ironic that at a time when most teams don’t have many sponsors, Ferrari – the team who always got by without needing them so much back in the day – now have loads. And then there’s Williams. Who… yeah. Basically the same as last year – with the addition of JCB as a new sponsor on the rear wing plates – but like Ferrari (and unlike Force India) they’ve made use of the big old flat panel to extend the Martini branding. Which actually looks nice, notwithstanding the big horrible rectangle it’s printed on to. What I’d really like to see with Williams is the basic colour scheme kept (I really like how the blue sponsor logos look on the white), but just with the Martini stripes taking over more of the back of the car. Except not on a big shark fin. Hmm. It could just be the light, but it appears they’ve simplified the livery to make it look like last year’s McLaren. Not sure if want. We’ll find out more tomorrow! The Mercedes’ sidepods should’ve been widened. Haas is just a darker shade of grey they had last year.